Behold, the Toyota Rolla. It looks like a Corolla, but it’s not. 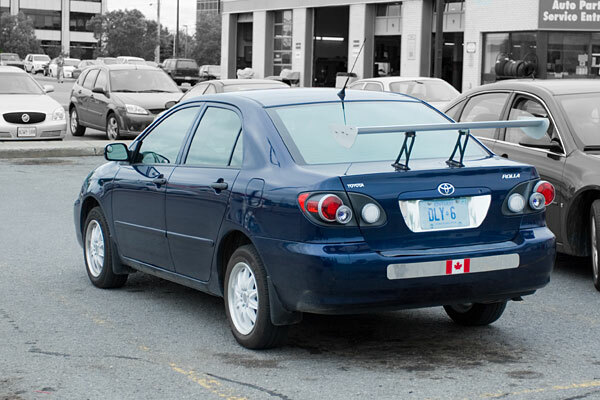 How many Corollas can go so damned fast that they have rear down-force issues, requiring a wing to keep things under control? None, that’s how many. The rear badging and unusual tail-lights prove the rare pedigree of this automobile. And yes, the title is a palindrome. Thank you for noticing. I loved my Corolla. If I ever get another kill me if I do anything remotely like that to it. It’s not a wing for downforce, It’s a handle to pick it up should the jackass who owns it park incorrectly. On the other hand it could just be a poor fashion statement to go with the stupid tail lights. 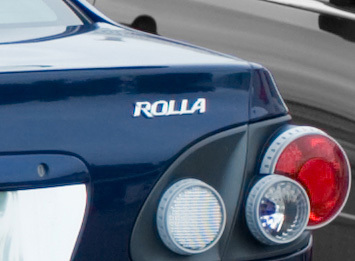 I bet the next improvement will be a “Turbo” emblem to go beside the Rolla. Don’t ya wanna just slap the fool! sand kicked in face should be next…without a happy ending. ‘ Too funny, Rick. ‘almost expect diplomatic plates. ps no obscuring the plate?